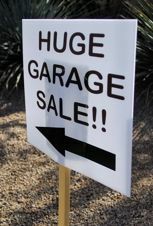 Many communities around the country host Garage Sale Days as a fun way to encourage people to get out and meet each other — either by hosting a sale and inviting buyers to come by, or by heading out to check out the sales around town. In 2005, Megawatt launched West Seattle Community Garage Sale Day as a community-building activity, and it continued to grow in 2006 and 2007. Megawatt announced in late 2007 that it would cease operations but hoped to find new presenters for its key annual events such as Community Garage Sale Day and Gathering of Neighbors. West Seattle Blog co-publishers Tracy Record and Patrick Sand threw their hat in the ring for Garage Sale Day, and Megawatt founder Mary Ellen Cunningham, with the support of her board members, decided to let us give it a try (Gathering of Neighbors is now presented annually by the community group VIEWS, Visualizing Increased Engagement in West Seattle). Our garage-saling experience dates back to early childhood — Tracy even has memories of tagging along with her champion-garage-saler grandma in a blue ’66 Mustang, learning shopping skills including how to haggle (when appropriate) for the best deal! Those memories, and your enthusiastic sale ideas and planning, conitnue to inspire us through this experience. Our main website, West Seattle Blog, is all about bringing people together to share ideas, knowledge, opinions, and information. We shared some good times at West Seattle Community Garage Sale Day 2008, 2009, 2010, 2011, 2012, 2013, 2014, 2015, 2016, 2017, 2018. Next up, WSCGSD 2019! If you have questions, please e-mail us here.